The WLA was formed in 1976 by a passionate group of women who were determined to form an organization that would support and promote women lawyers in all of their endeavors. Decades later, the WLA continues its mission to advance women in the legal profession, promote diversity, equality and justice within the legal system, and improve the status of women in the community. Amongst many of its contributions, the WLA gives scholarships to exemplary law students, provides valuable networking opportunities to members, and endorses candidates for judicial positions. What is our current state of the WLA? What are our strengths, weaknesses, opportunities, and threats? How will we measure achievement of these goals? The WLA is committed to improving its organization and strengthening its positive affect on the legal and general community. Through strategic planning, the WLA hopes to specifically address the needs of the organization. Survey. In the Fall 2014, the WLA asked its members to complete a ten (10) question survey about the WLA. The answers from the survey served to provide insight regarding what members believe are the strengths and weaknesses of the organization. Presidents’ Gathering. In January 2015, the WLA held a gathering of all Past-Presidents to find out from the leaders of the WLA what issues they feel need improvement. Board Retreats. The WLA held two (2) Board Retreats this year to help the Board digest opinions received from members about the growth of the organization and begin implementing changes. Formation of Five-Year Plan Committee. A committee comprised of Past-Presidents and Board members was created to specifically develop the Five-Year Plan. Outreach to Members. Board members have been contacting and communicating with members throughout the year to help develop the Five-Year Plan. The WLA is a Missouri non-profit organization. The WLA is led by a Board of twelve (12) women, including six (6) Officers (President, President-Elect, Vice-President, Secretary, Treasurer, and Past-President) and six (6) Members-At-Large. The WLA Board holds monthly meetings to discuss the business of the WLA. As a chairperson or co-chairperson of a committee, the Board member is responsible for planning events and for promoting the goal(s) of the committee. Currently, there are approximately three hundred (300) members of the WLA. All members must be lawyers or law students. The cost of membership to the WLA varies. Membership to law students and first-year lawyers is free. Attorneys working in the public sector are offered a reduced fee for membership. Also, members have the opportunity to pay an amount greater than the membership fee, with the additional amount donated to the WLA Foundation. The Women Lawyers’ Association Foundation (the “Foundation”) was formed in 1999 and was originally named the Women Lawyers’ Association Scholarship Fund. Its original purpose was “[t]o provide scholarship for worthy and deserving female law students attending law schools in the State of Missouri.” On April 25, 2002, the IRS recognized the organization as exempt from federal taxes based on 501(c)(3) status. In the years that followed, an amendment to its purpose and a name change occurred. Now, the Foundation serves broader charitable and educational purposes, which still includes providing scholarships to female law students. Most specifically, the Foundation provides funds for the Linda J. Murphy Scholarship. A legal profession in which women hold equal status with men as measured by representation and compensation at all levels, positions of leadership and influence, and recognition of collective and personal achievement. Collaborate with other individuals and organizations to improve the status of women. Goal 1.1: Promote prudent fiscal operations to produce large, healthy operating budgets and increase growth for the WLA Foundation to $200,000.00. Objective 1.1: Promote efficient and effective ways to reduce operating costs. Objective 1.2: Seek alternative sponsorships for various events. Objective 1.3: Rely on electronic media and technology for increased awareness and reduction in operating costs. Objective 1.4: Provide each committee with a budget for events to use throughout the year. Complete an annual review of budget, including a review of the cost of all events and sponsorships. Increase fundraising opportunities for the WLA Foundation. Goal 2.1: Increase membership of the WLA to 500 members. Objective 2.1: Target law schools in Missouri and Illinois for increased communication and involvement. Objective 2.2: Identify and reach out to in-house counsel and public practice attorneys that would benefit from membership. 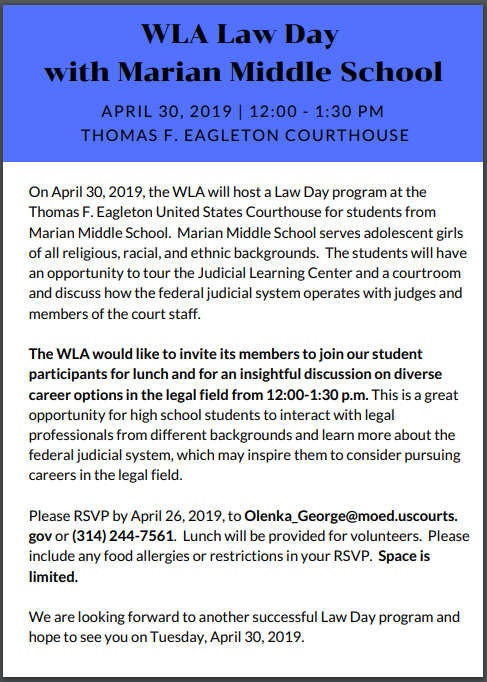 Objective 2.3: Identify male attorneys who would promote and demonstrate the WLA’s mission. Objective 2.4: Hold annual recruiting events and/or increase awareness at lawyers’ association activities. Complete an annual review of the number of new members, including a specific break down of the types of new members WLA is receiving. Discuss with new members about methods to continue to obtain growth. Goal 3.1: Educate and empower women to achieve leadership positions and judicial positions. Objective 3.1: Identify women who would be successful in leadership positions and judicial positions that they are seeking. Objective 3.2: Help women gain resources and education to achieve leadership positions or judicial positions that they are seeking. Objective 3.3: Provide social media support and administrative support to assist the women in running campaigns for positions related to the judiciary. Objective 3.4: Recommend women to obtain leadership awards. Completion and success of the campaign or election. Measure the number of supporters that are involved in the campaign or election. Measure the number of women who earn awards and recognition because of their accomplishments. Goal 4.1: Obtain influence in the legal and general community. Objective 4.1: Identify media sources that could assist in promoting the WLA. Objective 4.2: Continuously contact the media for coverage of larger WLA events. Objective 4.3: Inform the media when a WLA member receives an achievement. Increased media coverage of at least 3 events and/or members per year. Obtained feedback from community regarding WLA events.